Young children should always have an adult and be in a group. A troop of kids look out for one another and it makes the experience more fun. Put name, address and phone number on your kid. It can be on their costume, bracelet or necklace. There are also GPS trackers that can be monitored by smartphone to find your kid if they happen to wander off. As children visit houses for sweets, make sure they know to never enter a home, even if they are asked to by the resident. It is understood that people walk in the street while they trick or treat. It is still smart to make sure you and your kids are looking both ways before crossing the road. Flashlights and glow sticks also help drivers see trick or treaters. Before leaving the house to trick or treat, round up the gang and decide on a route. This makes it easier for everyone to stick together. It’s also easier for parents to keep tabs on their children if they have an idea of where they may be. As a community, we want every child to be safe on Halloween. If you see any behavior that puts you, your kids, or other children at risk, call your local police department immediately. Long dresses or robes can be a walking hazard for kids. Masks can also make it difficult for kids to see where they are going. Pick costumes that are easy to move around in and provide clear vision. It is always a good idea to check the candy your kids have received. Discard candy that is not factory sealed, smells strange or covered in an unknown substance. This is a good time to let your kids have access to a smartphone. It helps them reconnect with the group if they get separated. Parents also have a way of contacting their kids if they are out of sight. It’s easier to trick or treat in an area that you and your kids are familiar with. Setting pre-determined routes and locating each other is much easier when you know your surroundings. Halloween is a time to bond with your kids and have fun. Keep these tips in mind as you go out and trick or treat this Halloween. Your Halloween safety plan will prepare you if an unexpected event occurs. It will also give you peace of mind knowing that you able to handle the situation if a problem arises. 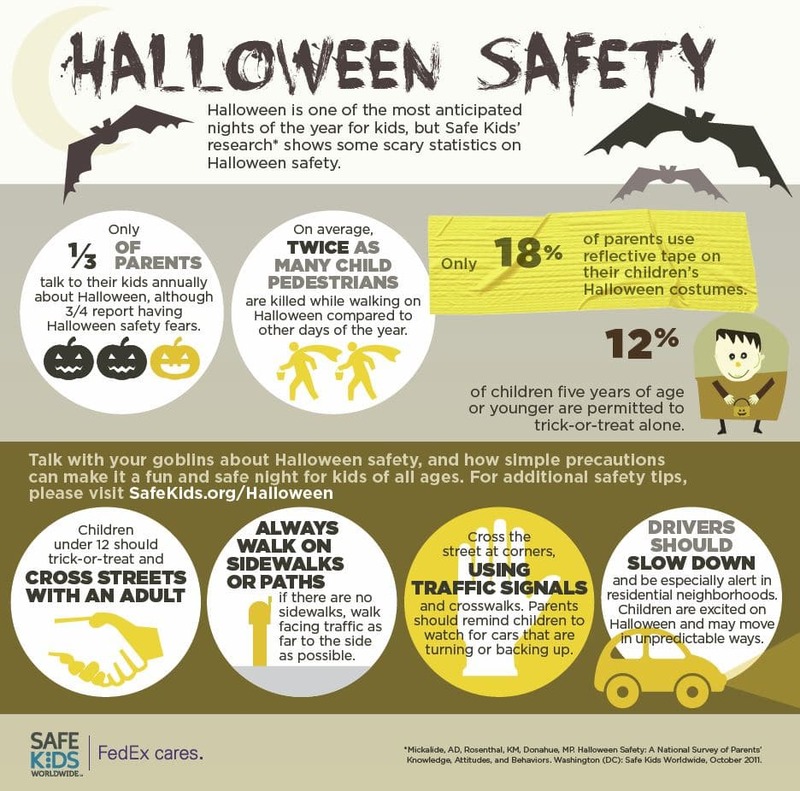 Safekids has made a fantastic infographic that provides additional information about Halloween safety. Happy Halloween!